This is one of only a few solocast episodes I’ve made over the past several years, but I wanted to talk one-on-one with you about self-care. If you’ve read my book or regularly listen to this show, you know I am a big proponent of self-care—I don’t think it’s even close to optional for parents raising atypical kids. And, I also recognize that it can be a hard thing to make time for and prioritize. I get asked a lot about what my self-care looks like, and so today, I’m sharing with you twelve strategies and ideas for creating a sustainable, doable self-care practice. These are all things I rely on and, I give you my word…they work. I’ve also created a printable PDF cheat sheet of these strategies in case you want to print them out and post them somewhere where you’ll regularly see them and be reminded of the importance of prioritizing YOU. To get the PDF, scroll down! 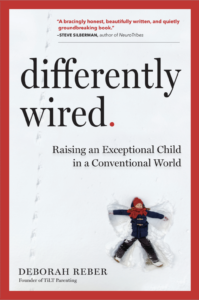 About Debbie: Debbie Reber is a New York Times bestselling author and the founder of TiLT Parenting, a website, top podcast, and social media community for parents who are raising differently wired children. To find out more about Debbie, visit the TiLT Parenting About Page. Want a visual reminder to help you stay in track in developing your own sustainable self-care practice? 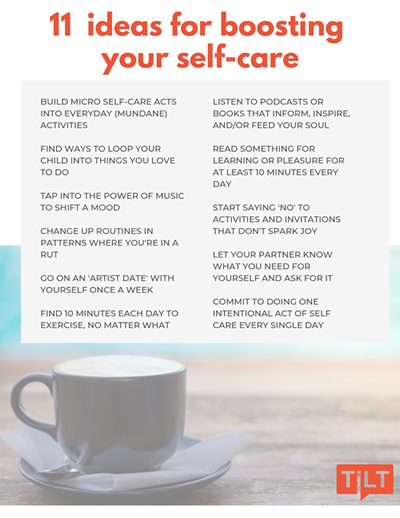 Download a PDF poster of my best tips for building more self-care into your daily life.